Around 1421-1425 Donatello began working in bronze. He created his first gilded bronze sculpture as a commission from the Parte Guelfa. 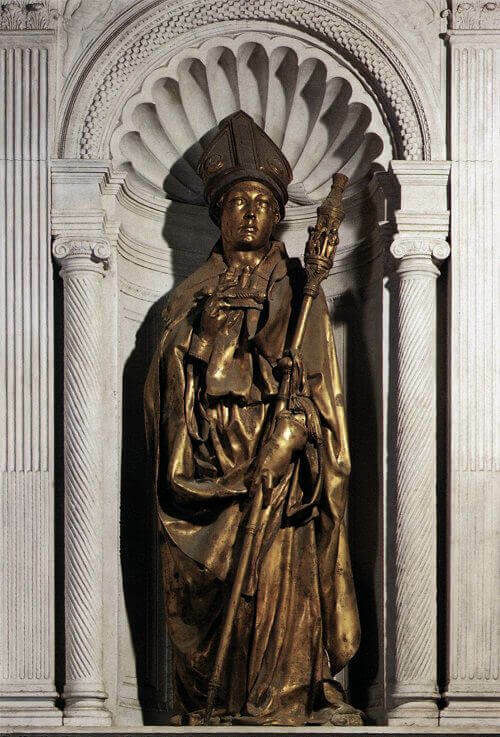 The statue of St. Louis of Toulouse was extremely ambitious and was created in several phases before finally being coated in bronze. St. Louis of Toulouse was a celebrated cadet in France that was crowned a Catholic Bishop. Donatello portrays him as a young man in flowing robes and crown. He clutches a pastoral staff and raises a finger of his free hand as if he wishes to quietly interject with his thoughts. Donatello's St. Louis was to be placed in a niche inside of the church of Orsanmichele. The Guelph family likely chose this particular saint because he represented obedience to the pope. Donatello seems to reflect this in his work with St. Louis' gentle questioning expression and hesitantly raised finger. When it was first placed in Orsanmichele Donatello's St. Louis would have been a glimmering gold with jewel encrusted accessories. In 1459 the Guelph family sold the tabernacle location at Orsanmichele and the sculpture was relocated to Santa Croce. Many years of exposure to the elements outside caused damage and fading to the gilded bronze shell. Donatello's St. Louis of Toulouse has been treated with multiple restorations and traveled in exhibitions internationally. It now resides inside the church of Santa Croce.